This is a good hearty Sunday lunch for a vegetarian. One thing I'm missing as I increase my vegetarian-ness is something that's a proper centrepiece for a Sunday roast - those "nut roast" things which are fairly common are OK but I don't think I've had one that could outshine the roast potatoes on a plate. Anyway toad to the rescue. Of course you can do toad-in-the-hole with veggy sausages, but this here is great and not pretending to be anything it isn't! Serves 2. Takes about 90 minutes in total, including a lot of oven-time where you can do other things. I recommend you serve this with onion and red wine gravy (takes about 30 mins in a gentle pan), and have some raspberry vinegar available to sprinkle on the pud. With a whisk or a fork, mix the milk, water and egg. Whisk the flour in, beating out any lumps. Now let this batter stand for a little while, e.g. 15 minutes, though it can easily rest for an hour. Preheat the oven to 210 C.
Brush a roasting tray with oil (olive or vegetable) and then spread the squash pieces out on it. 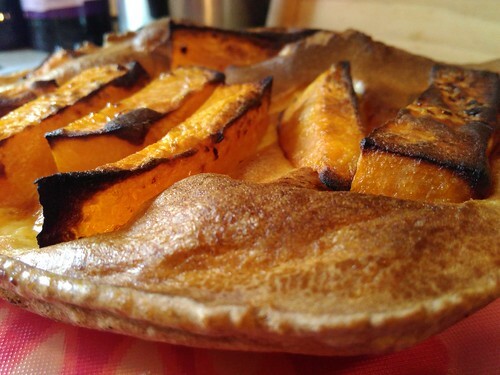 Drizzle over some more oil then roast the squash in the oven for about 40 minutes. They're going to get a bit more cooking after this, so they don't need to be "done" - they need to be at the point where they're just starting to soften and to get some darkening caramelisation at the edges. While the squash is roasting, prepare the roasting tin in which you'll cook the toad. This needs to be at least 1 inch deep. Put a good glug of vegetable oil in, and then put this in the oven alongside the other stuff, so the tin and the oil can pre-heat to a good hot heat. Take the squash out of the oven. If you leave them out a couple of minutes, they'll cool a bit so they're easier to handle in the next step. Next is assembling the toad. It has to be done quickly! So that everything's hot in the hot tin. Quickly get the hot tin from the oven, pour the batter into it, then place the squash pieces one-by-one into the middle of the batter with a bit of space between them - and immediately return this to the hot oven and shut the door. This then cooks for 20-25 minutes until the batter is risen and crusty, the squash is nicely cooked and getting a nice roast colour. If you have more pieces of squash than you can accommodate in the tin, simply put them back on the roasting tray and continue to roast them. You can serve them alongside.